Ganesha Yantra is used to gain the blessings of Lord Ganesha, the first worshiped God in Indian Mythology. A person wearing “Ganesha Yantra: never faces lack of wealth and income and always grows with respect and fame in his/her life. Lord Ganesha is know as "Obstacle Remover". Lord Ganesha removes all the obstacles from the life of the devotee. Ganesha is the God of success and overcoming obstacles, but is also associated with wisdom, learning, prudence, and power. As the god of success, his names are chanted at the start of any important venture. As the remover of obstacles, he is invoked at the start of every journey, marriage, religious rite, house construction, the writing of a book or even a letter. One should wear Ganesha Yantra duly created and energized (Praanpratishthit) on Bhoj Patra. As per Indian Mythology, Mahalakshmi, Goddess of Wealth is worshiped along with Lord Ganesha. A devotee always want to have wealth with no hurdles and so he worships Lord Ganesha and Goddess Mahalakshmi simultaneously. 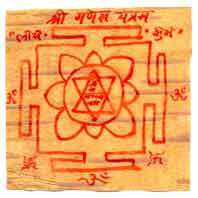 It is always recommended to wear Ganesh Yantra along with MahaLakshmi Yantra or Shree Yantra duly written and energized on BHOJ PATRA. The people who have borrowed money from others and facing problems in repaying it should wear Ganesha Yantra duly created and energized (Praanpratishthit) on Bhoj Patra. Ganesha Yantra is recommended for a smooth running business or profession. One can either wear it on his neck or can tie it on his upper arm or can place it in the drawer at his business place. AstroMuni brings you " Ganesha Yantra " created on Bhoj Patra. Ganesha Yantra is energized on the auspicious night of Deepawali in auspicious time (Lagna) using auspicious pen (kalam) and ink (Draveya). If your are the one who is facing financial problems. If your are the one who is facing difficulties to repay the loan. If your want the blessings of Lord Ganesha. AstroMuni recommends you to use “Ganesha Yantra” created and energized by the experienced Vedic Professionals. They will energize “Ganesha Yantra” particularly by your name or the name suggested by you. “It” is created to enhance the never-ending wealth, money, property, success, fame, and reputation in society and to fulfill the wishes of the wearer. Know more..